The Historic Environment Scotland exhibition of aerial photographs of Stirling and Central Scotland before 1954 continues at the Stirling Smith..
Aerial photographs have a perennial fascination for people as they reveal so much. 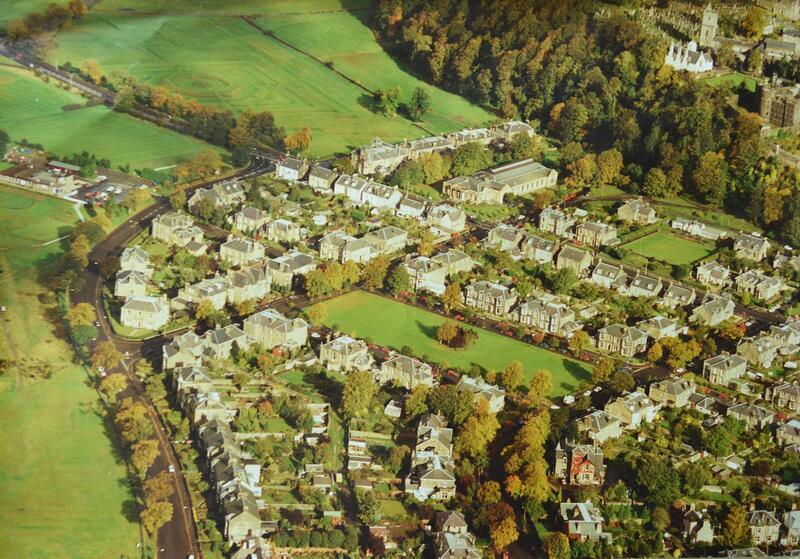 This view of Kings Park, from the top of Victoria Place looking north to the Old Town Jail, Cowane’s Hospital and the Church of the Holy Rude at the top of the town, was taken in about 1978. It shows a cityscape which to all appearances has not changed much in 30 years. The Kings Park area was previously the royal hunting park. Later, it was divided into different fields or crofts from which the burgh derived income rentals. Sand quarrying also took place at various points. With the coming of the railways in 1848, the opportunity was taken to feu out the area for the building of villas whose owners might work in Glasgow or Edinburgh, thanks to the new transport. In the 1970s, Kings Park became a conservation area, prohibiting modern intrusions. At this time, there was no roundabout at the junction of Queen’s Road and Albert Place, no car park in the grounds of the Stirling Smith and the big trees which now shroud the building had just been planted. The photograph was donated by Jamie Burgoyne who found it in a charity shop.